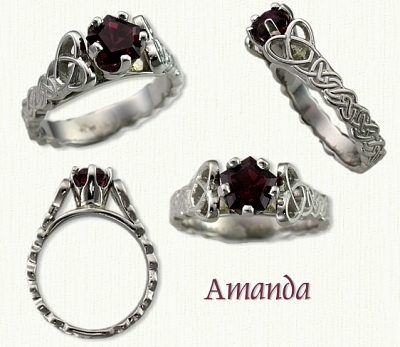 Celtic 'Amanda'Engagement Rings: White Gold, Yellow Gold Engagement Rings. 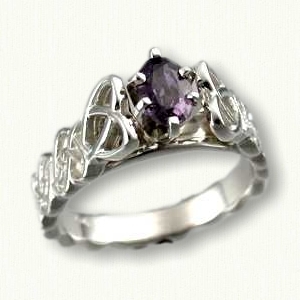 Description: The 'Amanda' engagement ring is a Medium Bridged Mounting. Pattern does not continue around the entire ring...small sizing panel. Any stone shape. The width is 7mm on top (heart) to 4mm in back. Available in 14kt, 18kt and platinum ( pricing ). Optional finishes for 14kt and 18kt include 18kt yellow gold electroplate and white rhodium are at an additional fee. Visit our Available Diamonds and Gemstones page to view photos of in stock stones.